1Centre for Research in Agricultural Genomics, CSIC-IRTA-UAB-UB, Barcelona, Spain. 2Graduate School of Biological Sciences, Nara Institute of Science and Technology, Japan. 3Max Planck Institute for Plant Breeding Research, Cologne, Germany. We were deeply saddened to learn that Ko Shimamoto passed away on 28 September 2013. Ko was an esteemed colleague, mentor and supervisor and his tremendous contributions to the flowering field have changed our view of photoperiodic control of flowering. We wished to pay tribute to him and have written an obituary, which has now been published in the Flowering Newsletter (Suárez-López et al., 2014). Ko was very active and productive, continuing to write manuscripts even when very ill. His scientific production encompasses many aspects of rice biology and biotechnology. Early in his career he produced the first fertile transgenic rice plants from protoplasts, when working at the Plantech Research Institute (Shimamoto et al., 1989). Then he moved to the Nara Institute of Science and Technology to establish his own laboratory. Since then, he worked mainly on three topics, plant innate immunity, gene silencing and flowering, using rice as a model plant. His contributions to the flowering field are especially remarkable. Plants sense and respond to environmental factors, including seasonal changes in day length, in order to flower under optimal conditions. Ko’s group showed that the short-day flowering habit of rice results from the use of essentially the same components as those that determine long-day flowering in other species, exemplified by Arabidopsis. In both species, GIGANTEA acts under inductive photoperiods and up-regulates the expression of two highly related genes, CONSTANS (CO) in Arabidopsis and HEADING DATE 1 (Hd1) in rice. CO and Hd1, in turn, regulate the expression of a gene that is essential for floral induction, FLOWERING LOCUS T (FT) in Arabidopsis and its rice homologue HEADING DATE 3a (Hd3a). While CO promotes FT expression under inductive photoperiods, Hd1 represses Hd3a expression under non-inductive photoperiods (Hayama et al., 2003). In this way, Ko’s group showed that the opposite roles of Hd1 and CO account for the opposite photoperiodic responses of rice and Arabidopsis, a key contribution to understanding the evolution of photoperiodic control of flowering. Another ground-breaking discovery from Ko’s group was the identification of Hd3a protein as a mobile signal that travels from the leaf to the shoot apical meristem, where Hd3a induces flowering (Tamaki et al., 2007). Hd3a is therefore an essential component of florigen, the long-sought after flowering signal, a result supported by studies in other species (Kobayashi and Weigel, 2007; Turck et al., 2008). In Arabidopsis, FT interacts with the transcription factor FD after reaching the shoot apical meristem. Ko’s laboratory showed that Hd3a and the rice FD homologue OsFD also form a complex and their interaction is bridged by a 14-3-3 protein (Taoka et al., 2011). While Hd3a is crucial for flowering under inductive short days, another FT-like protein, RICE FLOWERING LOCUS T 1 (RFT1), plays an essential role in flowering of rice under long days and acts as a long-day florigen (Komiya et al., 2008; Komiya et al., 2009). In addition to his outstanding findings in flowering biology, Ko’s group also made major contributions to many other areas of plant science, most importantly plant innate immunity and gene silencing. His group also developed diverse tools for the study of rice. We had the double privilege of knowing Ko and enjoying his science. We encourage the readers of this blog to learn about him and his remarkable scientific achievements. Hayama R, Yokoi S, Tamaki S, Yano M, Shimamoto K. 2003. Adaptation of photoperiodic control pathways produces short-day flowering in rice. Nature 422, 719-722. Kobayashi Y, Weigel D. 2007. Move on up, it’s time for change – mobile signals controlling photoperiod-dependent flowering. Genes and Development 21, 2371-2384. Komiya R, Ikegami A, Tamaki S, Yokoi S, Shimamoto K. 2008. Hd3a and RFT1 are essential for flowering in rice. Development 135, 767-774. Komiya R, Yokoi S, Shimamoto K. 2009. A gene network for long-day flowering activates RFT1 encoding a mobile flowering signal in rice. Development 136, 3443-3450. Shimamoto K, Terada R, Izawa T, Fujimoto H. 1989. Fertile transgenic rice plants regenerated from transformed protoplasts. Nature 338, 274-276. Suárez-López P, Tsuji H, Coupland G. 2014. 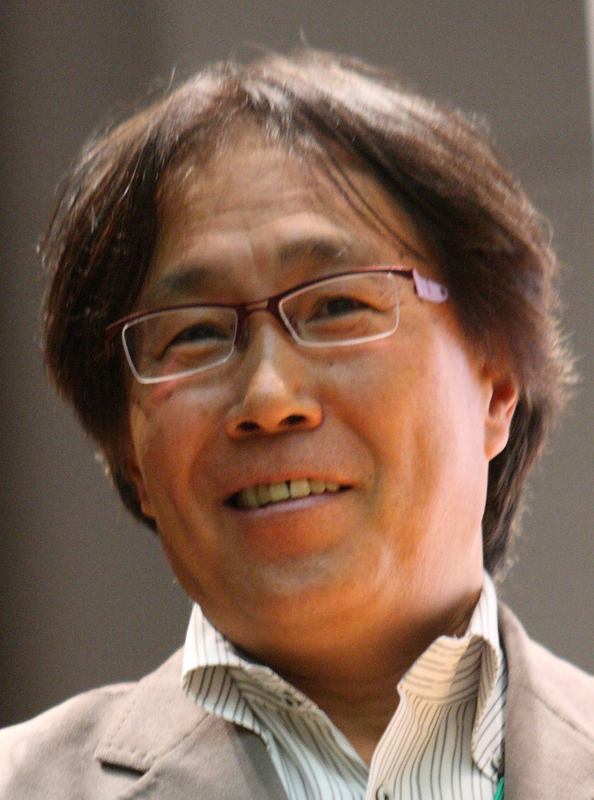 A tribute to Ko Shimamoto (1949–2013). Journal of Experimental Botany. doi:10.1093/jxb/eru104. Tamaki S, Matsuo S, Wong HL, Yokoi S, Shimamoto K. 2007. Hd3a Protein Is a Mobile Flowering Signal in Rice. Science 316, 1033-1036. Taoka K-i, Ohki I, Tsuji H, Furuita K, Hayashi K, Yanase T, Yamaguchi M, Nakashima C, Purwestri YA, Tamaki S, Ogaki Y, Shimada C, Nakagawa A, Kojima C, Shimamoto K. 2011. 14-3-3 proteins act as intracellular receptors for rice Hd3a florigen. Nature 476, 332-335. Turck F, Fornara F, Coupland G. 2008. Regulation and Identity of Florigen: FLOWERING LOCUS T Moves Center Stage. Annual Review of Plant Biology 59, 573-594. This entry was posted in flowering, Uncategorized and tagged Ko Shimamoto, Paula Suarez-Lopez, photoperiodic control of flowering. Bookmark the permalink.